AutoZone (AZO) "Revisiting a Stock Pick"
There have been many stocks that have been reviewed on this blog. Some of them have been purchased by me in my 'trading account' or more recently into either my Covestor "Buy and Hold Value" model or my Covestor "Healthcare" model that has allowed me to share actual trading strategies and portfolios with my readers. The rest of the posts are either about stocks that didn't do very well since writing them up (yes I have lots of those too) and the stocks that I report on, never purchase, and then later review that they like the great fish on the line, are ones that 'got away'. Autozone (AZO) is definitely a stock that has eluded me and that currently I do not own any shares. I wrote up AutoZone (AZO) on December 4, 2007, when it had closed at $128.80. AutoZone closed at $324.02 on 10/7/11, up $1.65 on the day. Let's take a closer look at this stock and see if it still worth including in this blog and possibly adding to an actual portfolio even after this incredible price appreciation! 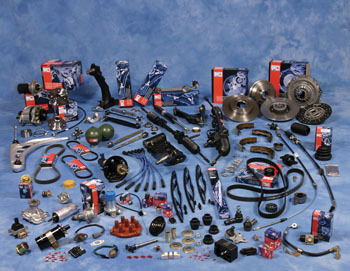 "...retails and distributes automotive replacement parts and accessories. The company's stores offer various products for cars, sport utility vehicles, vans, and light trucks....The company also offers commercial sales program that provides the delivery of parts and other products to local, regional, and national repair garages, dealers, service stations, and public sector accounts. In addition, it sells the ALLDATA brand automotive diagnostic and repair software through the Website, alldata.com; and automotive hard parts, maintenance items, accessories, and non-automotive products through the Website, autozone.com. As of May 7, 2011, the company operated 4,467 stores in the United States and Puerto Rico, and 261 stores in Mexico. AutoZone, Inc. was founded in 1979 and is based in Memphis, Tennessee." As I have written and we all certainly are aware of, the economy in the United States and indeed globally is weak as we all work to get out of the worldwide slowdown. News stories abound how Americans are holding their cars longer and repairing them instead of looking for a replacement vehicle. As expected this bodes well for auto parts stores like AutoZone (AZO). On September 20, 2011, AutoZone reported 4th quarter 2011 results. For the quarter ended August 27, 2011, the company had a 12.1% increase in profit from $268.9 million the prior year to $301.5 million. Earnings per share grew 26.9% to $7.18 from $5.66 last year exceeding analysts expectations of $6.98. Revenue for the quarter increased 8.1% to $2.64 billion, ahead of analysts expectations of $2.61 billion. Same store sales in the U.S. increased 4.5% during the quarter. Reviewing the Morningstar.com financials on AZO, we can see that revenue has steadily increased from $5.95 billion in 2006 to $7.36 billion in 2010 and $7.88 billion in the trailing twelve months (TTM). Earnins have also steadily increased with $7.50/share reported in 2006 increasing to $14.97/share in 2010 and $18.18/share in the TTM. During this time outstanding shares have decreased from 76 million in 2006 to 49 million in 2010 and 45 million in the TTM. Briefly examining the Morningstar.com balance sheet figures, we see that the latest numbers find AutoZone with $2.6 billion in current assets as opposed to $3.064 billion in current liabilities a ration under 1.0. However 'free cash flow' has been improving from $559 million in 2006 to $1.02 billion in the TTM suggesting that this deficit in current assets over current liabilities is easily managed. However, I do prefer to see companies with an excess of current assets over current liabilities and maybe AZO would be better off building its balance sheet a bit over the continued share buy back (?). In terms of valuation, Yahoo "Key Statistics" on AutoZone shows us that the company is a large cap stock with a market capitalization of $13 billion. The trailing p/e is a moderate 16.64 but with solid growth the forward p/e (fye Aug 27, 2013) is estimated at 12.53. The dynamic growth expected from AZO results in a very reasonable PEG of 0.96. Yahoo reports currently the company has only 40.11 million shares outstanding with a float of 27.96 million. There are 1.47 million shares out short yielding a short interest ratio of 3.70, slightly higher than my own arbitrary '3 day rule' for significance. No dividends are paid and the company last split its stock 4/21/94 when a 2:1 split was distributed. 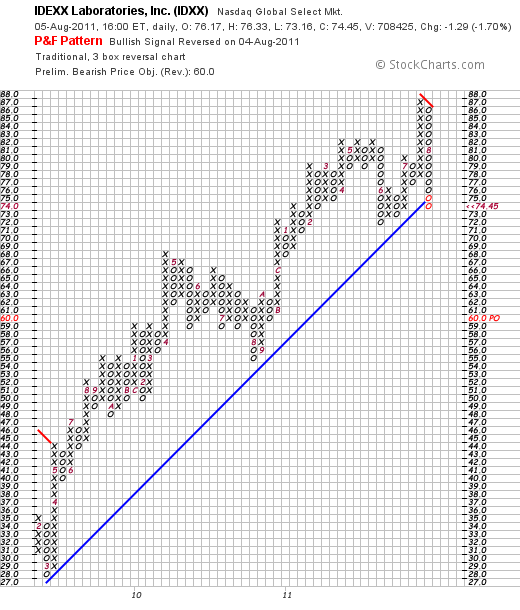 Reviewing the 'point & figure' chart on AZO from StockCharts.com, we can see that the stock declined to a low of $136 in November, 2009, before starting its virtually meteoric climb to its current level of $324.02. If anything the fast rise of this stock suggest that it is 'overextended' but it shows remarkable strength! To summarize, AutoZone (AZO) has been a terrific stock (if you owned shares) the past couple of years. It may well be a retail area (auto parts) that is recession resistant. It continues to do well with a strong recent quarterly report that exceeded expectations, the stores are reporting sustainable same-store sales growth, and they are buying back shares steadily supporting the per share results as well as the stock price. On the negative side, the company seems to have a slight dearth of cash vis a vis the current assets vs current liabililties. However, the strong free cash flow growth is easily handling this. Otherwise, technically, I am a bit afraid that I may be a bit late to the party here and would rather see this stock pull back a bit before stepping in myself. Of course, I probably said the same thing back in 2007! Valuation isn't bad at all with a trailing p/e in the mid-teens and a PEG ration under 1.0. Thank you again for stopping by and visiting! If you have any comments or questions, please feel free to leave them right here on the blog! On September 1, 2011, I purchased shares in Costco (COST) for my "Buy and Hold Value" model in my Covestor account. The shares were purchased with a cost basis of $80.14. 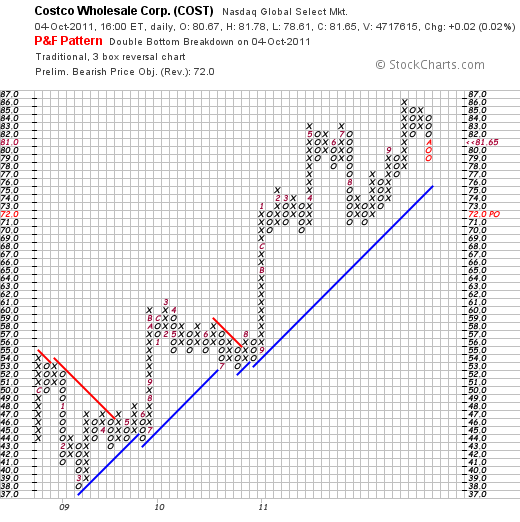 Costco (COST) closed today (10/4/11) at a price of $81.65, up $.02 or .02% on the day. With the economy continuing to teeter on the edge of a 'double-dip' recession, I have along with other investors found a small amount of hoped-for safety in the companies that can do well when times are rough for many Americans. Some of the stocks I hold include Costco (COST) that is a leading warehouse store providing discounted goods to members when bought in bulk, McDonald's (MCD) which remains a staple value fast-food outfit that seems to be recession-resistant, TJMaxx (TJX) which with its occasional high-end brands that it stocks at close-out prices may be competing with Target (TGT) for the distinction of "cheap chic", and Perrigo (PRGO) which provides the cash-strapped consumer an opportunity to buy knock-off products in the form of house brands at cheaper prices at stores like Walgreen (WAG). September 'same-store sales' results should be released shortly, but the latest results from August, 2011, found Costco (COST) with same-store sales growth of 6%. On May 25, 2011, Costco (COST) reported 3rd quarter results with earnings of $324 million or $.73/share compared with earnings of $306 million or $.68/share the prior year. Analysts however, were expecting earnings of $.77/share, but the continued solid reports of same-store sales growth have supported the continued stock price appreciation since. In terms of valuation, if we look at the Yahoo "Key Statistics" on Costco, we can see that the market cap is a large cap size $35.75 billion. The trailing p/e is a tad rich at 25.51 with a better forward p/e (fye Aug 29, 2012) of 21.26. However, even with this growth, the PEG is a bit rich as well at 1.96. COST has 437.81 million shares outstanding and has 9.65 million shares out short as of 9/15/11, representing 3.5 trading days, a little bit above my own arbitrary '3 day rule' for short interest. The company pays a forward dividend of $.96/share yielding 1.2% at its current price. The payout ratio is a modest 27% suggesting plenty of room for continued dividend payment and possible growth in the amount. The company last split its stock 1/14/00 with a 2:1 split at that time. Reviewing some of the Morningstar.com financials for a longer-term view of this company we can see that revenue, except for a dip in 2009, has grown steadily from $60.1 billion in 2006 to $77.9 billion in 2010 and $84.8 billion in the trailing twelve months (TTM). Similarly, except for a dip in 2009, earnings have also grown steadily from $2.30/share in 2006 to $2.92/share in 2010 and $3.20/share in the TTM. Diluted outstanding shares have been reduced during this perior from 480 million in 2006 to 446 million in 2010 and 443 million in the TTM. The balance sheet appears adequate with $11.7 billion in most-recent current assets reported, compared to $10.06 billion in current liabilities. During this period free cash flow has soared from $615 million in 2006 to $1.7 billion in 2010 and $1.6 billion in the TTM. 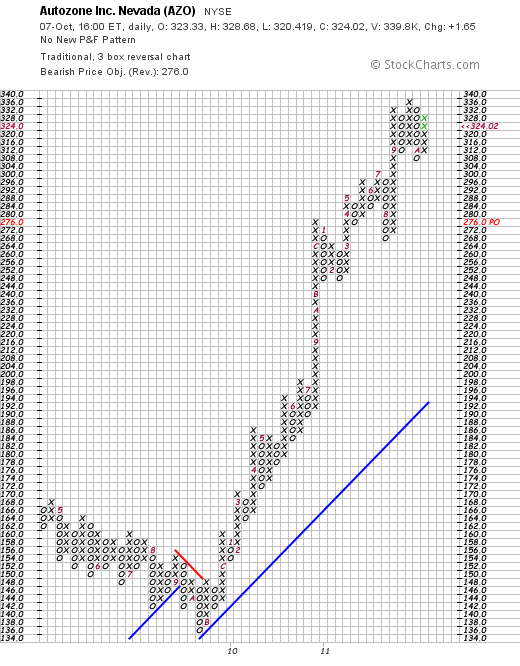 Finally, the Costco (COST) 'point and figure' chart from StockCharts.com is a beautiful chart with a steady increase in price from a dip in 2009 in March when the stock hit $38/share to its most recent high of $86 in September, 2011. The stock has pulled back slightly to its current close at $81.65. To summarize, I recently purchased shares of Costco (COST) in my own belief that it offered some relative recession-resistance in terms of attracting more value-driven buyers in this difficult economic environment. They continue to report steady and strong same-store sales growth, they pay a dividend, have a long-term record of growing their revenue and earnings and generating a solid free cash flow, and have a great chart as well. I cannot predict whether we are to be entering into a double-dip recession, whether the deadlock in Congress will continue, whether the Fed will do a "twist" or another round of 'quantitative easing', whether Greece or Italy will resolve their financial problems or any other crisis which may affect the market. However, I shall continue to concentrate on those companies that continue to do well fundamentally as well as technically as we review stocks and the companies they represent. Thank you again for stopping by and visiting my blog. If you have any comments or questions, please feel to leave them right here. I am fully aware of the effects of the debt downgrade by S&P on U.S. Government debt. The downgrade may push the already weakly recovering economy back into recession. As I write, stock futures are strongly negative for the opening tomorrow (Monday). Beyond that, I am wise enough to know that it is a fool's game to predict the market beyond what is immediately seen. It is well known that stocks often climb a wall of worry as the negative news becomes quickly 'baked into the cake' and investors and institutions look beyond the immediate future into longer-term possibilities. That being said, I am being quite cautious and am willing to miss a rebound to avoid a large loss with much of my holdings in my Covestor Healthcare and my Covestor Buy and Hold accounts sitting in cash. Please consult with your own professional investment adivsers regarding the current market environment to assist you in dealing with the tremendous volatility! With all of that said, I still remain committed to identifying the highest quality companies that might be considered for investing. Recently I purchased some shares of IDEXX (IDXX) at $85.79 on 7/22/11 only to sell them just last week on 8/4/11 at a price of $78.02 for a loss of $(7.77) or (9.06)%. As much as possible I try to limit my losses after initial purchases to 8% and also to avoid quickly reinvesting those funds to avoid compounding losses in a market downdraft. I do not currently own any shares of IDEXX (IDXX). However, I believe that IDEXX (IDXX) is a great company and when the market sorts out, might well be considered for investment once again. Let's take a closer look at this company and see if it is indeed worth a place in my blog and in my portfolio. "...develops, manufactures, and distributes products for the veterinary and production animal markets, as well as for the water testing and dairy markets." Like so many of my amateur stock 'picks' I start with an earnings headline that catches my attention. 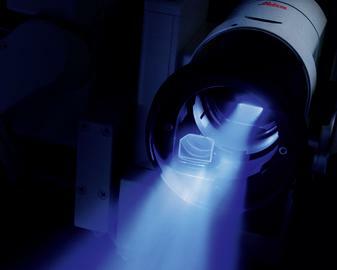 On July 22, 2011, IDEXX (IDXX) announced 2nd quarter 2011 results. The company reported revenue for the quarter of $317.9 million a 13% increase over the prior year's revenue result. This exceeded expectations of $308 million. Earnings came in at $.83/share up from $.62/share last year. This also exceeded expectations of $.72/share. To top it off the company raised guidance for the full-year to revenue of $1.205 to $1.215 billion and earnings of $2.68 to $2.73/share up from prior guidance of $2.66 to $2.71/share. Reviewing longer-term results, we can see on the Morningstar.com "Financials" that revenue has increased from $739 million in 2006 to $1103 million in 2010 and $1164 million in the trailing twelve months (TTM). Earnings per share have grown steadily from $1.49/share in 2006 to $2.45/share in 2010 and $2.72/share in the TTM. The outstanding shares have actually been reduced from 66 million in 2006 to 60 million in 2010 and 59 million in the TTM. Examining a few numbers from the Morningstar.com "Balance Sheet" on IDXX, we can find that the total current assets are listed as $461 million compared to the total current liabilities of $285 million. This yields a current ratio of 1.62. The Morningstar.com "cash flow" analysis on IDXX shows free cash flow improving from $38 million in 2006 to $140 million in 2010 and $144 million in the TTM. In terms of valuation, using the Yahoo "Key Statistics" on IDXX, we find that this is a mid cap stock with a market capitalization of $4.23 billion. The trailing p/e is a moderate 28.09, and the PEG also is a tad rich at 1.88. According to Yahoo there are 56.8 million shares outstanding with 56.28 million of them that float. As of 7/15/11 there were 3.95 million shares out short representing a short interest ratio of 14.5. This appears quite significant as my own arbitrary cut-off on this is 3.0 days. The company does not pay a dividend and last split its stock November 27, 2007, when it split 2:1. Reviewing the IDEXX Laboratories 'point & figure' chart from StockCharts.com, we can see that the stock has moved strongly higher since March, 2009, when it was trading as low as $28 to its recent peak at $87 in July, 2011. The stock has recently sold off sharply down to $74.45, breaking through the plotted support line. To summarize IDEXX Laboratories (IDXX) recently caught my attention with an outstanding earnings report that beat expectations on both the revenue and earnings side. This veterinary supply/equipment company also raised guidance for the full year. They have a record of steadily growing revenue and earnings for the past five or more years and have a solid balance sheet with growing free cash flow and diminishing outstanding shares. Value-wise, the p/e ratio is a bit rich at 28 and the PEG is also a bit rich at 1.88. The short-sellers apparently agree as quite a few shares are out short with a short-interest ratio of 14.5. I do believe that as the market settles down from its recent volatility, this might be a good place to revisit for a possible investment. Meanwhile, I also am battening the hatches waiting for this financial storm to pass by. Thank you again for stopping by and visiting my blog! If you have any questions or comments, please feel free to leave them right here on the website. With the market turning in an awful performance I felt it would be negligent if I didn't at least comment on this turn of events even if I cannot claim to have any sort of answer on how to deal with it. Today the Dow dropped a little over 500 points representing an approximately 4% loss, and the NASDAQ did even worse dipping over 5%. This evening, the Asian Markets responded with 3-4% losses as I write. For specifics on how I am responding to this correction, you can check out my Covestor Buy and Hold Model or my Covestor Healthcare Model that I have been utilizing to monitor my own holdings and to develop and document the results of my own strategy for investing. Although less than stellar, I have continued to sell portions of my holdings and even full positions at times as I have shifted from equities into cash based on the weakness of my own holdings. I have not been quite as disciplined regarding exact percentages to determine these sales. And in fact, have been whipsawed with yesterday's 'dead-cat bounce' into timidly putting my feet back into the water only to have my toes slammed shut on the door of the ongoing bear correction. When dealing with an entire portfolio that is behaving poorly, as has been my experience, I have chosen to shave shares off of all of the individual holdings. When added to the sales of a couple of the weakest positions, this has moved me from under 5% cash to over 40% cash over the last two weeks. In general I have avoided much political discussions on this blog, choosing rather to emphasize some investment rules for identifying stocks. However, with what appears to be such a poor result on the debt-ceiling extension as a result of intense efforts by Tea Party Congressmen to hold the line on the debt ceiling, I feel it necessary to add my own 2 cents to the mix. First of all, the debt ceiling, which has been raised numerous times under both Democrat and Republican Administrations is not the place for a confrontation over the level of spending. The debt-ceiling is just an arbitrary 'credit limit' that limits the amount that this nation can borrow to pay off its current obligations. That is, this debt-ceiling represents an artificial limit that restricts out nation from borrowing by issuing bonds and other debt instruments to pay off the existing agreed upon spending. The place to argue about spending is in appropriation bills not in debt-ceiling limits that just endanger our very economy and threaten default on our obligations. Second, nobody likes paying taxes. Yet they represent the income that government incurs to go about its business whether it be in defending this nation with our military, or helping to make sure that our Seniors stay out of poverty with Social Security and Medicare payments. We can afford to take care of our elderly and our needy in this, one of the richest nations in the world. As negotiations dragged on due to the apparent inability of Republicans to consider closing loopholes because one unelected Grover Norquist had convinced these Representatives to sign a pledge not to raise taxes, the fact seemed to escape most Americans that our tax burden was actually the lowest in sixty years. We were not a very heavily taxed nation when compared just to ourselves let alone other Western nations. When our President proposed letting the Bush Tax Cuts expire for those earnign over $250,000, the cry rang out of "class warfare" against those who would target the wealthy. However, somehow nobody noticed that there has already been class warfare the past 25 years in America as wealth migrated from the lower and middle class to the top 1% and even to even smaller portions of the very wealthies of Americans. Not only would taxation of the wealthy be a great source of income to help reduce our deficit, but funding infrastructure projects that provided jobs for the middle class would also fuel out economy and increase the chance of recovery. Simply put, austerity in the midst of a deep recession is madness. It amounts to putting the patient on a calorie restricted diet when they are already starving to death. Maybe I am naive, but I do not believe that once I have paid my taxes, a patriotic duty and responsibility, I am the victim of theft or that the government has 'my' money as President George W. Bush liked to state. Nor do I believe that "Government is the Problem" as President Reagan stated. I do not believe as Grover Norquist has suggested that "Our goal is to shrink government to the size where we can drown it in a bathtub." Instead I believe that in America, there is no other better vehicle for dealing with those without health care, those without jobs, those who are hungry or homeless, or those who cannot take care of themselves than the assistance of the government to deliver that help. Keynes wasn't wrong. Our ability to emerge from this recession will take a strong stimulus that will also simultaneously address our crumbling infrastructure from bridges to highways, to schools and yes even to building high speed rail lines across America. When instead of seeking to heal the ill patient that is the economy we discontinue our intervention and try to let nature run its course, we shall find that the course that nature directs us is not a pleasant or happy one. We shall once again scrape bottom in manufacturing, in job creation, and in delivering health care to the ill and the elderly. Some have suggested that the GOP has chosen to undermine the economic recovery as a poor economy would improve their electoral chances in 2012. I refuse to be so cynical. I believe that they truly trust benign neglect to solve problems that require active intervention. Thanks for bearing with me as I get this off my chest and review the injuries to my portfolio that I believe are due to a nation that has placed fiscal handcuffs on its leader in order to shelter the loopholes and tax liabilities of the wealthy, of the beneficiaries of wasteful largesse, and of the corporations who would prefer to operate without regulatory restaint regardless of what is best for individual Americans. Hello Friends! Thanks so much for stopping by and visiting my blog, Stock Picks Bob's Advice! As always, please remember that I am an amateur investor so please consult with your professional investment advisers prior to making any investment decisions based on information on this website. On June 30, 2011, I purchased shares of Cooper Companies (COO) for my Covestor Healthcare Model at a cost basis of $80.62. Cooper has been a company I have admired for the most part from a distance and in fact first reviewed the stock almost 8 years ago on September 1, 2004. Cooper closed at $80.08, down $(.55) or (.68)% on the day. Let's take a closer look at this stock and update my review! "... through its subsidiaries, develops, manufactures, and markets healthcare products serving the vision care and women’s healthcare markets worldwide. It offers a range of soft contact lenses for the vision care market, such as toric lenses, which correct astigmatism; multifocal lenses for presbyopia; and spherical lenses that correct the common visual defects. 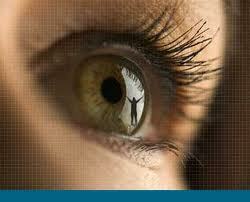 The company also provides aspheric lenses for near and farsightedness. In addition, it engages in the development, manufacture, and marketing of medical devices, diagnostic products, and surgical instruments and accessories used primarily by gynecologists and obstetricians." On June 3, 2011, Cooper (COO) reported 2nd quarter 2011 results. For the quarter ended April 30, 2011, the company reported revenue of $325.3 million, an 8% increase (in constant currency) exceeding the Zacks estimates of $315 million. The company reported adjusted earnings per share of $1.02, exceeding expectations by Zacks of $.93/share and outperforming the year-ago earnings result of $.61/share. To top off the fabulous quarterly report, the company raised guidance for fiscal 2011 to a higher range of $3.90 to $4.05/share vs. earlier guidance of $3.60 to $3.80/share. Similarly revenue expectations were guided slightly higher by the company to a new range of $1.23 to $1.3 billion from prior guidance of $1.265 billion to $1.29 billion. Examining the Morningstar.com "5 Years Financials" on Cooper (COO), we can see that revenue for the company has grown steadily from $859 million in 2006 to $1.16 billion in 2010 and $1.23 billion in the trailing twelve months (TTM). Earnings dipped from $1.44/share in 2006 to a loss of $(.25) in 2007 only to rebound to $1.43 in 2008, $2.21 in 2009, $2.43 in 2010, and $3.56 in the TTM. Outstanding shares have been very stable with 48 million reported in 2006 and 47 million in the TTM. Examining the balance sheet, as of October, 2010, Cooper according to Morningstar had $491 million in current assets and $200 million in current liabilities. This yielded a current ratio of 2.46. Thus the balance sheet at least in these measurements demonstrates significant strength. Free cash flow has bounced around somewhat increasing from $8 million in 2006 to $176 million in the TTM according to Morningstar.com. In terms of valuation, examining the Yahoo "Key Statistics" on Cooper, we can see that this is a mid cap stock with a market capitalization of $3.76 billion. The trailing p/e is a moderate 22.42, the forward p/e (fye Oct 31, 2012) is estimated at 17.44, and with solid growth predicted, the PEG ratio works out to a reasonable 1.25. Yahoo reports that the company has 46.9 million shares outstanding with 46.21 million that float. Currently there are 925,000 shares out short, representing 1.6 trading days of volume, well below my own idiosyncratic 3 day rule for significance of the short interest ratio. The company pays a small dividend of $.06/share yielding 0.1% with a payout ratio of only 2%. The last reported stock split of The Cooper Companies (COO) was a 2:1 stock split on November 25, 2002. Insofar as the technicals are concerned, Cooper (COO), as seen in this Point & Figure Chart from StockCharts.com, sold off in late 2008 from $40 down to a low of $10.50 in November, 2008. The stock moved higher, breaking through resistance in April, 2009 at the $29 level, and since then has stayed well above support levels reaching a high of $82 this July, 2011, and closed today (7/18/11) at $80.03, down $(.55) or(0.68)% on the day. In summary, Cooper (COO) is an 'old favorite of mine' that has been performing very well the past two years both technically and fundamentally. Their latest earnings report was strong beating guidance for both revenue and earnings and the company chose to guide estimates higher. Fundamentally, they have been steadily growing revenue and earnings the past five years, have a solid balance sheet, and growing their free cash flow. Outstanding shares are stable, but dividend-wise, could be better. The company sells at a moderate p/e but sports a PEG of only 1.25 suggesting that valuation is reasonable when earnings growth and estimated growth is considered. Finally, the momentum of the past two years is quite impressive as this stock moves strongly higher in a steady fashion. As noted, I liked this stock enough to add it to my own Healthcare Model on Covestor. Thank you so much for stopping by and visiting! If you have any comments or questions, please feel free to leave them right here on the blog! Hello Friends! Thanks so much for stopping by and visiting my blog, Stock Picks Bob's Advice! As always, please remember that I am an amateur investor, so please consult with your professional investment advisors prior to making any investment decisions based on information on this website. On May 20, 2011, I added to my position of Hibbett (HIBB), purchasing shares at $39.42. Hibbett is currently one of my nine holdings in my Covestor "Buy and Hold Value" model. I have been a long-term fan of this company and have owned shares on and off over the years. One of my earliest review of Hibbett (HIBB) on this blog was more than six years ago when I wrote up Hibbett on March 10, 2005. What has intrigued me and continues to attract me to Hibbett (HIBB) is the retail model that seems to parallel the tremendous growth that another retailer, Wal-Mart Stores (WMT) has experienced. Like Wal-Mart, Hibbett started out in the south, headquartered in Birmingham, Alabama, and has chosen to locate its sporting good stores in small towns often right in a Wal-Mart shopping center. Ideally, a retail firm can develop a concept and then roll it out into additional outlets with growth coming both from 'same-store' increases and additional growth as new sites are established. Until such time as the concept has 'exhausted' its retail opportunity, an investor can hopefully successfully hold a stock that likely will parallel the underlying growth with appreciation in the price of the related shares. At least that's the theory! "...operate sporting goods stores in small to mid-sized markets predominantly in the Southeast, Southwest, Mid- Atlantic and the Midwest. As of January 29, 2011, we operated 779 Hibbett Sports stores as well as 16 smaller-format Sports Additions athletic shoe stores and 3 larger-format Sports & Co. superstores in 26 states. Our primary retail format and growth vehicle is Hibbett Sports, a 5,000 square foot store located primarily in strip centers which are usually influenced by a Wal-Mart store. Approximately 76% of our Hibbett Sports store base is located in strip centers, which includes free-standing stores, while approximately 24% of our Hibbett Sports store base is located in enclosed malls. We expect to continue our store base growth in strip centers versus enclosed malls." Certainly, when picking stocks we need more than just good ideas, we need implementation of those ideas into practice. One of the best ways to examine a company's performance is to check its latest quarterly report! On May 23, 2011, Hibbett (HIBB) reported 1st quarter (ending April 30, 2011) results. Earnings came in at $.76/share ahead of the Zacks estimate of $.68/share and significantly higher than last year's $.59/share. Sales for the quarter came in at $203.7 million, up 10.4% from $184.5 million and ahead of Zacks estimate of $201 million. Comparable stores increased a very healthy 6.8%. According to this report, this was the company's sixth consecutive quarter of comparable store sales growth. Operating margin improved '180 basis points to 16.8% from the prior-year quarter'. During the quarter the company opened 8 new stores and closed 7 underperforming stores with total reported at 799 stores in 26 states. In addition, the company raised guidance for the fiscal year to a new range of $1.80 to $1.95/share up from $1.70 to $1.90/share previously provided. According to Morningstar, Hibbett (HIBB) has total current assets of $269 million as of 1/2011. Total current liabilities are at $94 million, yielding a current ratio of just under 3. Free cash flow has improved from $20 million in 2007 to $51 million in 2011 and $65 million in the TTM. In terms of valuation, looking at the Yahoo "Key Statistics" on Hibbett (HIBB), we can see that this company is a small cap stock with a market capitalization of $1.08 billion. The trailing p/e is moderate at 22.45 with a forward p/e (fye Jan 29, 2013 est.) at 17.77. The PEG ratio (5 yr expected earnings) works out to a more reasonable 1.16. Yahoo reports 27.32 million shares outstanding with 27.16 million that float. As of June 15, 2011, there were 4.68 million shares out short representing a short ratio of 9.7 days of trading volume. This is above my own arbitrary 3 day rule for short interest and may be a bullish indicator for this stock. The company does not pay a dividend and last split 3:2 in September, 2005. 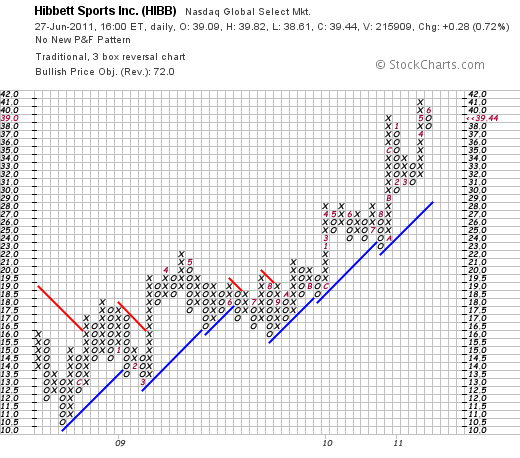 If we examine the StockCharts.com 'point & figure' chart on Hibbett (HIBB), we can see that this stock which traded as low as $10.50 in November, 2008, has steadily and regularly moved higher to its current level of $39.44 where it closed today (6/27/11). Simply put, the above chart is quite strong as the company has broken through resistance time after time the past two years and has moved higher above support levels. To summarize, I like Hibbett (HIBB) and have been a fan and intermittent owner of the stock over the last 8 years as I have chronicled here on this blog. The company is carefully executing its expansion tracking alongside many Wal-Mart stores in strip malls in the south, southeast and midwest. They reported strong earnings that exceeded expectations in both the earnings amount as well as the sales figures. Furthermore, they raised expectations. Valuation appears reasonable althought the p/e is in the low 20's, the PEG is just a bit over 1.1. Finally the chart looks strong. Frankly, I am more 'couch potato' than 'jock', but I can see value in the investment in this sporting goods firm. Thanks so much for stopping by and visiting! If you have any comments, please feel free to leave them right here on the website. One of my holdings in my own trading account is Perrigo (PRGO) that I purchased on 2/2/11 with a cost basis of $73.19. Perrigo closed at $83.46 on 6/10/11, down $(1.23) or (1.45)% on the day. I would like to share with you my thoughts on this stock as they illustrate once again my thinking on what makes a stock attractive for purchase. "... through its subsidiaries, develops, manufactures, and distributes over-the-counter (OTC) and generic prescription (Rx) pharmaceuticals, nutritional products, infant formulas, active pharmaceutical ingredients (API), and pharmaceutical and medical diagnostic products worldwide." One of the first things I check when examining a stock for investment is how the underlying company is doing. Probably the most important factor is their latest quarterly report. Looking at this information I certainly would like to see a company that can grow its business (organic growth preferred over growth just from acquisitions), is profitable and is doing better than expected. Sometimes we as investors can get lucky and the company raises the ante so to speak by increasing guidance. A price of a stock is determined by past and expected results. There is a certain re-equilibration of the stock price as analysts and investors digest the provided information and re-set estimates going forward. 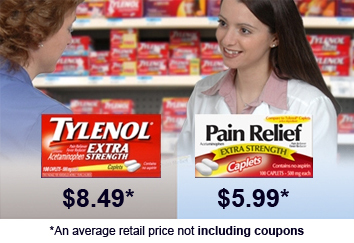 On May 3, 2011 Perrigo reported third quarter 2011 results. Revenue for the quarter came in at $691.6 million, a 29% increase from the prior year which in itself is an impressive results. However, equally important the company exceeded expectations of $685.8 million. Earnings came in at $89.1 million or $.95/share for the quarter ended March 26, 2011. Adjusted income from continuing operations (what analysts generally are estimating) came in at $1.07/share. This was a 43% increase in earnings over the prior year when the company had reported earnings of $62.2 million or $.67/share. Similarly, analysts had been expecting earnings of $.96/share so the adjusted income again exceeded expectations. Occasionally companies use earnings announcements to provide guidance for analysts and investors about how management is viewing future prospects for the business. Hopefully the company is anticipating growth in earnings and revenue. Sometimes they will confirm pre-existing guidance, but it is also possible that managenent can reduce guidance or on the other hand, if things are doing well, the company may well revise prior estimates and raise guidance. Again, if we consider that stock prices are determined in a complex fashion that takes into consideration estimates of future earnings, clearly raising guidance will cause some investors to reprice the value of the given stock higher. In any case, Perrigo, in the same earnings report raised guidance for adjusted earnings per share to come in at $3.90 to $4.00, up from the prior guidance of $3.75 to $3.90. Ideally, a stock will perform well not because it just reported a single quarterly report that looked good, but rather that the company was continuing a longer-term record of such positive financial results. I utilize Morningstar.com which provides both free as well as subscription information. If we look at the Morningstar financials on PRGO, we can see that revenue has grown steadily from $1.37 billion in 2006 to $2.27 billion in 2010 and $2.67 billion in the trailing twelve months (TTM). In that same period diluted earnings per share have grown steadily from $.77/share in 2006 to $2.40/share in 2010 and $3.23/share in the TTM. Morningstar shows that free cash flow, has increased from $90 million in 2006, dipping to $24 million in 2007, then steadily growing to $258 million in 2010 and pulling back a touch to $255 million in 2011. This company clearly is able to generate increasing cash as it grows its business. In terms of the balance sheet, Perrigo has $1.381 billion in current assets balanced against $907 million in current liabilities. This generates a current ratio of 1.52. Generally current ratios of 1.5 or higher suggest a healthy, at least short-term, financial health. Perrigo has total assets of $3.09 billion compared to total liabilities of $2.01 billion. Beyond the fact that a company underlying a stock is doing well, which apparently Perrigo (PRGO) has been doing, it is important to find out about the valuation of the stock price to help determine if the purchase of the shares is a reasonable option. I have found that the easily accessible Yahoo "Key Statistics" continues to be helpful in this regard. For Perrigo, we can see that the market cap is $7.74 billion making this a large cap stock. Perrigo's trailing p/e is a bit rich at 25.87, but the forward p/e (fye Jun 26, 2012) is a bit better at 18.30. The reasonableness of a p/e is really a function of anticipated growth. You and I are obviously more willing to pay higher p/e valuation if we are fairly certain that future earnings will increase significantly. This 'dynamic valuation' is calculated via the PEG ratio which for Perrigo comes in at a fairly reasonable 1.59. Perrigo has 92.73 million shares outstanding with 85.67 million of them that float. The company pays a modest dividend of $.28/share with a forward yield of .30%. (The trailing dividend is 0.27 indicating a recent increase.) The company has lots of room to raise the dividend and use earnings for corporate purposes as their payout ratio is only at 8% per Yahoo. Their last stock split was back in August, 1993, when the stock was split 2:1. Finally let's take a look at the technicals which basically for me is an examination of the point and figure chart from StockCharts.com. 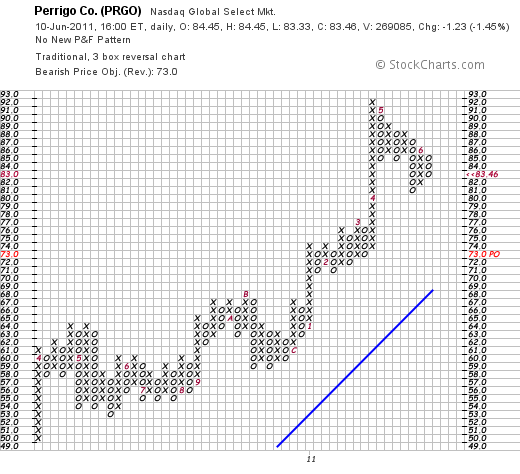 In particular, checking Perrigo's Point & Figure Chart from StockCharts.com, we can see a chart that was basing through much of 2010 between the $53 and $65 level and that 'broke out' in March, 2011 to its recent high of $92 before pulling back to its $83 level. The chart looks strong from my amateur perspective. In summary, I like Perrigo (PRGO) enough that I bought shares! From a 'story' perspective, the challenges that our current economy faces has forced more consumers to watch their purchases closely and Perrigo fits into that theme selling companies 'store brand' generics to compete with more expensive branded items. They recently reported a very strong quarterly report and have been growing their business steadily for the last five years. Their recent results exceeded analysts' expectations and the company provided bullish guidance going forward. Valuation is a tad rich but not really wildly out of balance with the expected performance. Technically the stock looks strong and appears to be a price move higher. I do not know what the stock market will hold going forward. It may well be wise to wait before entering any new positions in a market we are facing, but I believe that long-term, it is wisest for the investor like myself to identify stocks of companies with the characteristics that I have commented on throughout my blog multiple times. I hope you find these evaluations useful! If you have any comments or questions, please feel free to leave them right here on the blog. A Reader Writes: "Juniper Networks (JNPR) is an Alternative to Cisco"
Recently I received a submission from a fellow blogger, Nicolas, who is a co-founder of a new "networking platform to classify and rank investors according to the performance of their stock tips" called Stocktipr.com. I cannot vouch one way or another for the information on that site but would encourage you to visit! Nicolas asked me if he could submit an article to this website, and without any further delay, what he wrote follows this introduction. He has let me know that he does not (as of June 4, 2011) have any shares nor does he have any financial relationship with Juniper (JNPR). Juniper Networks, with headquarters in Sunnyvale, California, is a computer networking products company. Many investors, when looking for a stock pick in the computer network category, naturally look to Cisco Systems, the most recognizable of these firms. However, Cisco is now trading at a 52 week low while its PE is heading toward single digits, something that veteran stock pickers thought would never happen. Cisco's recent guidance warned that fourth quarter revenue would “be relatively flat compared to the prior year period, which represents lower revenue levels than we had previously anticipated at the beginning of fiscal 2011.” This is not positive news and obviously does not bode well for the near term. 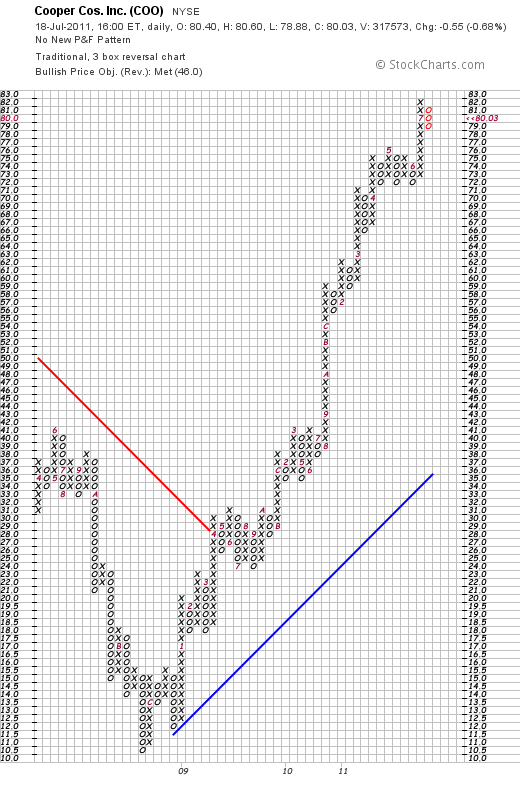 Cisco may look cheap around 16 dollars per share, but it is trading there for a reason. Remember, cheap stocks many times get cheaper. Although Juniper is significantly smaller than Cisco, the company appears to be very nimble. In fact, in a recent article, Forbes said "competitors like Juniper, HP and Alcatel-Lucent have been making inroads and nipping at Cisco's market share in its core markets like switching and routers." As good investors know, many times small companies are able to innovate and move at a much quicker pace than large entities. Those looking to enter the computer network sector would be well served by Juniper. Strong revenues coupled with solid earnings and positive investor sentiment makes Juniper an excellent choice in this sector. Nicolas is co-founder and president of Stocktipr.com, a new networking platform to classify and rank investors according to the performance of their stock tips. Nicolas does not own any shares of Juniper Networks for now and don’t have any financial relationship you might have with the company. Nicolas is an amateur investor, so please remember to consult with your professional investment advisers prior to making any investment decisions. Thank you Nicolas! I do not personally have an opinion on Juniper (JNPR) which closed at $31.90 on 6/9/11, but shall add it to my own 'watch list' and see how this stock tip of yours works out! Good-luck to you on your own website, and hopefully we can arrange some additional guest posts right here! 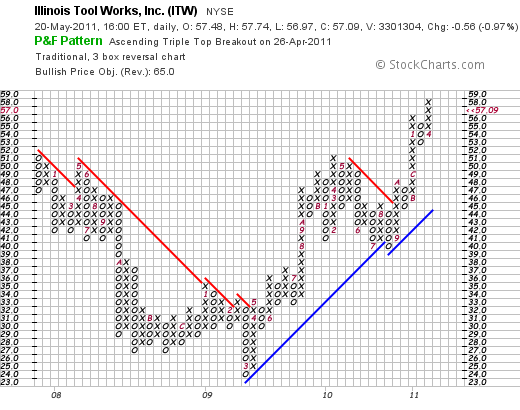 Last month, on April 26, 2011, I purchased shares of Illinois Tool Works (ITW) at a cost basis of $58.97. ITW closed at $57.09 on 5/19/11, down $(.56) or (.97)% on the day. I still like this stock and wanted to share with you my thinking on this one. The economic recovery has been anemic for many complex reasons, but the industrial base has started to recover. Anticipating this stock rotation into industrial companies, I have purchased shares of Danaher (DHR) which I discussed earlier as well as Illinois Tool Works (ITW). When I think about investing in a stock, one of the strongest factors influencing that decision is the very latest quarterly report. In brief, did the company show strong growth, beat expectations, and provide positive guidance? If they did, and the company has a record of reasonably steady growth, a strong chart, and good value as well as acceptable financials, I am interested. You might say that's a lot to ask of an investment. Fortunately, there are a lot of stocks to choose from and we all can stand to be a little selective in our purchases. "...manufactures a range of industrial products and equipment worldwide." The company's divisions include a 'Transportation segment', an 'Industrial Packaging segment', a 'Food Equipment segment', a 'Power Systems & Electronics segment, a 'Construction Products segment', a 'Polymers & Fluids segment', and a 'Decorative Surfaces segment'. On Tuesday April 26, 2011, (the same day I purchased shares), Illinois Tool Works (ITW) announced 1st quarter results. Revenue for the quarter came in at $4.39 billion, ahead of analysts' expectations of $4.16 billion. Adjusted net income came in at $623.1 million or $1.24/share ahead of the $333.8 million or $.66/share last year. Removing a one-time benefit of $.33/share from a settled Australian tax case, the company earned $.91/share also ahead of expectations of $.84/share. To top off the report, the company announced new revenue guidance of $18.41 to $18.73 billion, an approximately 11.5 to 14.5% increase over the prior year. Full-year earnings are now expected to come in at $4.16 to $4.34/share, well ahead of prior guidance of $3.60-$3.84/share. In addition, for the upcoming quarter the company forecasted earning sof $.99 to $1.05/share on revenue of $4.77 to $4.89 billion. Analysts are currently expecting $1/share on revenue of $4.59 billion. This is the kind of earnings report I like to see on making a decision to buy shares! Looking at longer-term results on Morningstar, the Financials show that revenue has been recently been improving with revenue which had dipped to $13.9 billion in 2009, improving to $15.9 billion in 2010 and $16.5 billion in the trailing twelve months (TTM). Similarly earnings/share (diluted) increased from $3.01/share in 2006 to a peak of $3.36 in 2007, then dipped to $1.89 in 2009 and improved to $3.03 in 2010 and $3.61 in the TTM. The company has kept the lid on share growth with 571 million in 2006 dipping to 500 million in 2009 before increasing slightly to 503 million in 2010. Morningstar shows that the company has $6.0 billion in current assets compared to $3.1 billion in current liabilities, with an almost 2.0 current ratio. Free cash flow is strongly positive but not growing with $2.1 billion reported in 2007 dipping to $1.3 billion in 2010 and $1.1 billion in the TTM. The company pays a nice dividend of $1.36/share with a forward annual yield of 2.4%. The last stock split was a 2:1 split on May 26, 2006. If we examine the 'Point & Figure' chart on ITW from StockCharts.com, we can see that the stock dipped from $51 in December, 2007, to a low of $24/share in March, 2009. Since that low, the stock has been technically very strong showing corrections with pull-backs each higher than the previous. In summary, Illinois Tool Works (ITW) represents a company, a bit like Danaher (DHR) that is a manufacturer rebounding as the American economy rebounds. They recently reported a solid quarterly report that beat what analysts had been expecting and the company went ahead and raised guidance from previous estimates of future performance. Valuation is solid, the financials are reasonable, and technically the stock appears to be 'on a roll'! I liked it so much I bought shares! Thank you again for visiting my blog. I shall continue to try to post entries a bit more regularly and I certainly appreciate your continued interest and support. I might even get around to a podcast later this week! Before I go much further I would like to apologize for my hiatus from blogging on this website. For those of you who regularly stop by, I am sure it is a disappointment to see a lack of activity on this website. For those of you new to the blog, thank you for stopping by! I shall work to keep this blog up to date. On May 13, 2011, I purchased shares of Danaher (DHR) at $54.44 in my own Trading Account. As part of my effort at trading transparency, I would like to share with you some of my own observations and things that made this stock attractive to me. Danaher closed at $53.99 on 5/16/11 up $.13 or .24% on the day. "...designs, manufactures, and markets professional, medical, industrial, commercial, and consumer products in the United States and internationally. 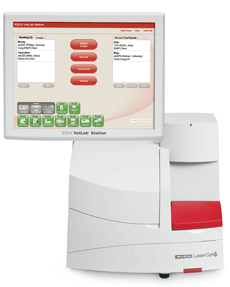 It operates in four segments: Professional Instrumentation, Medical Technologies, Industrial Technologies, and Tools and Components." Looking at the latest quarterly report, Danaher (DHR) reported 1st quarter results on April 21, 2011. Earnings came in at $429.4 million or $.63/share compared with $300.2 million or $.45/share the prior year. From my perspective, besides the solid earnings report, the company exceeded expectations of $.57/share according to Thomson Reluters. In addition, the company also beat expectations by reporting revening of $3.35 billion an 11% increase over the prior year. In that same report, the company optimistically raised guidance for analysts and increased its estimate of 2011 profits to $2.65 to $2.75/share up from prior range of $2.55 to $2.70. As reported, analysts are currently looking for $2.69/share. An earnings report that reveals solid results that beat expectations and finds management raising guidance is about my equivalent for an earnings "Nirvana". What else could an investor want from a news announcement? Reviewing the Morningstar.com 'Financials' on Danaher, we can see that revenue has grown from $9.6 billion in 2006 to $13.2 billion in 2010 and $13.5 billion in the trailing twelve months (TTM). Earnings have increased from $1.74/share in 2006 to $2.64/share in 2010 and $2.80/share in the TTM. Both revenue and earnings dipped between 2008 and 2009 and have rebounded since that time. Outstanding shares have increased during this time from 651 million in 2006 to 683 million in 2010 and 685 million in the TTM. Morningstar reports that Danaher (DHR) has $5.7 billion in 'Total Current Assets' as of 12/10, compared with a total $3.3 billion in 'Total Current Liabilities' yielding a healthy Current Ratio of 1.73. Free Cash Flow has increased from $1.4 billion in2006 to $1.87 billion in 2010 and $1.90 billion in the TTM. In terms of valuation, reviewing the Yahoo "Key Statistics" on DHR, we find that the company is a large cap stock with a market capitalization of $35.85 billion. According to Yahoo, the company has a trailing p/e of 19.15, a forward (fye Dec 31, 2012) p/e of 17.42, and a PEG ratio (5 yr expected) of 1.22. From my perspective, a PEG of under 1.5 demonstrates reasonable valuation. The company has 664 million shares outstanding with a float of 547 million. As of 4/29/11, there were 10.9 million shares out short, slightly ahead of my own '3 day rule' for short interest ratio, suggesting some bullish potential of these short shares. The company pays a small dividend of $.08 yielding 0.2%. There is a lot of room for dividend increases as this represents a payout ratio of only 3%. The company last had a stock split June 14, 2010, when it declared a 2:1 stock split. 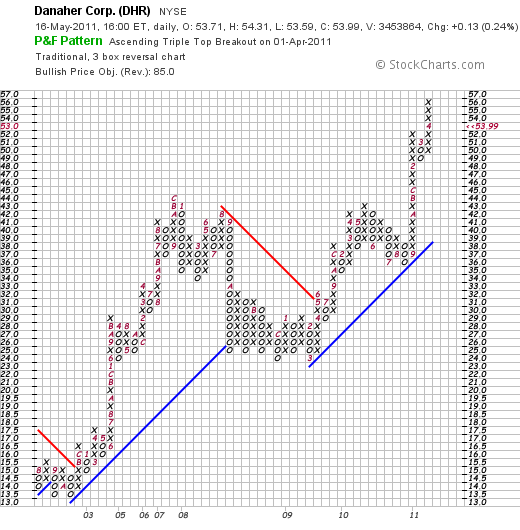 In terms of technical performance, we can examine a Point & Figure chart from Stockcharts.com on Danaher (DHR). This stock has shown tremendous strength since breaking out in May, 2003, at the $17 level and climbing into the mid $40's. After pulling back to the $25 range in 2008, the stock once again broke out in March, 2009 and has climbed to its current levels after peaking in April, 2011, in the $56 range. In conclusion, Danaher (DHR) represents an investment opportunity reflecting the continued American economic recovery. Even though the stock has already performed quite well this year, valuation-wise the company is selling at a PEG of just over 1.2, and just reported revenue and earnings that exceeded expectations while raising guidance for the near future. All of these facts and especially the solid earnings results encouraged me to add this stock to my own portfolio. Thank you again for stopping by and visiting my blog. Your loyalty, especially with my own neglect of this website, is appreciated. If you have any comments or questions, please feel free to leave them on the blog.